This is a beautiful dark mahogany 8 foot bar. This stunning bar features nine removable shelves. It is very roomy, and the bartender space completely depends on how you choose to set the front and back pieces. Please note the height of the back piece as it requires a high ceiling space. 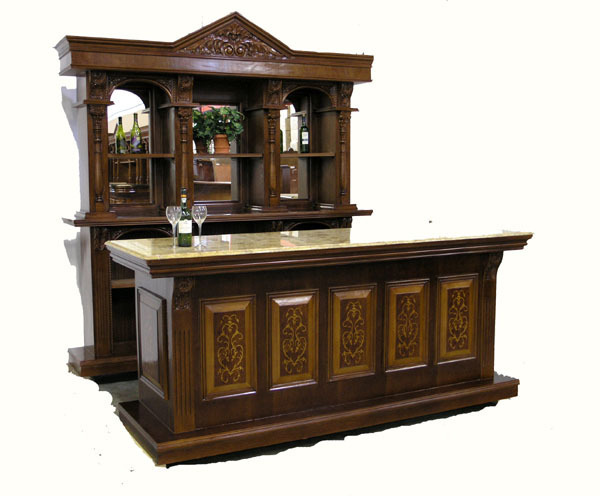 This bar is loaded with many architectural accents including half-turned columns, fluted corners on the front piece, rope edging, acanthus carvings and a carved pediment crown. There are 3 mirrors on the back piece and the bar is completed by a beautiful variegated beige marble top. All the shelves are removable so you can customize the bar to your needs. .